OilPro carefully selects new or excellent quality surplus plants which include a full inspection and original design specification package. Plants include, but are not limited to, Amine, mechanical refrigeration, molecular sieves, choke plants (JT) and stabilizers. This unit is built in such a way that it can be scaled up to 30 and 40 MMSCF/d capacity without requiring major refitting. Unit is skidded and housed. Project cancellation caused unit to be surplus. Design•	Gas Flow Rate (std m3/d) 564,000 Initial (~20.0 MMscfd)•	Operating Pressure (kPag) 11000 Normal•	Inlet Temperature (%u00B0C) 70 Max•	Gas Molecular Weight See Gas Composition•	Design Pressure (kPag) of Major Equipment 14,200•	Design Temperature (%u00B0C) of Major Equipment Refer to Individual Data Sheets•	Fuel Gas Sweet (by customer)•	Electrical Classification Class 1, Zone 2•	As per UOP Recommendations,•	Regeneration system is designed for flow rates of 170 std e3m3/d (6.0 MMSCFD). Inlet Gas Cooler E100 •	7.2 x 12 x 4RF 10130.3 FT%u00B2 ext surface. 1) The silica gel material will remove moisture as requested in the RFQ. The a silica gel system would have two towers diameter ~ 6ft vs 4.5 ft. If the intent of the silica gel is to eventually remove hydrocarbons for hydrocarbon dew point control. It is important to note that the silica gel selected will remove moisture only. The silica gel which is utilized for hydrocarbon and dew point control will foul in the presents of high concentrations of H2S and heavy hydrocarbons. 2) The molecular sieve material offers water dew point control with a smaller diameter tower then the silica gel. Natco selected molecular sieve, if the client requires a silica gel quotation the tower diameter and the regeneration flow will increase. A further decrease in cost can be realized if the client could increase the outlet specification from a water dew point less than -10 %u00B0C at 5516 kPa. This option should be seriously considers prior to order. Natco has gone to a 1500# orbit valve in-order to find a carbon steel mating flange. The Orbit valves are categorized under ANSI B16.34 can uses a 900# flange @ 600%u00B0F and meet a 12,500 kPag design pressure. Natco would like to substitute to valve specifically design to handle the material the softer molecular sieve material rather then the more abrasive silica gel material at a price savings. Orbit Valves estimates a saving of 30 to 50% in the valve pricing. Natco experience with high H2S regeneration is system is that they are prone to sulfur fouling of the air cooler. 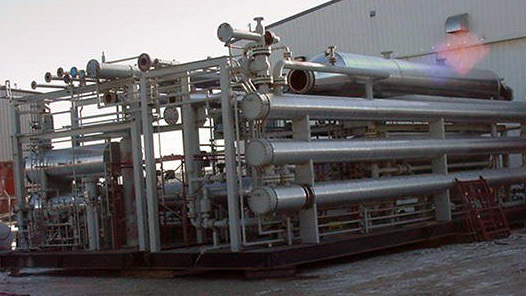 It is a standard procedure to heat the gas to the air cooler and melt the sulfur the regenerator separator. This procedure is conducted during the stand-by time on the regeneration cycle. Natco has maintain the 1500# flange rating to the regeneration separator which will allow this procedure. Natco also recommends a slight continuous flow through the heat in-order to prevent hydrate formation. Natco Canada, Ltd. has not coated the process water piping or vessels in this quotation, however believe that this should be considered. The composition provided does not require any hydrocarbon dew point control. The Mechanical design has been done according to the RFQ. As listed below. 2. SALT BATH HEATER:•	-One (1) 72" OD x 20'-0" S/S•	-(2) Non-Removable 20" OD x 20'-0" long (one way) firetube 5.75 MMBTU/hr total net duty•	-Internals seal welded one side only where required for process, stitch welded otherwise•	-Coil, See Below.•	-Note: Fire tube liner is not included in quotation. 7. INSTRUMENTATION:•	See attached instrument list for instruments and manual valves. INSTRUMENT TUBING:•	Instrument supply/drains•	Size (W.T. ): 3/8" (0.035")•	Fitting brand name: Swagelok•	Fitting material: 316SS•	Ferrules material: 316SS•	Tubing material: 316SS•	Tubing clips: SS and/or Plastic•	Pressure test: Air tested to normal operating pressure•	Process leads•	Size (W.T. ): 1/2" (0.065" for 900# section)•	Fitting brand name: Swagelok•	Fitting material: 316SS•	Ferrules material: 316SS•	Tubing material: 316SS•	Tubing clips: SS and/or Plastic•	Pressure test: Air tested to normal operating pressure-Quantities and sizes as•	listed on the attached P&ID's.•	NOTE: Unit to be disassembled only to the extent required for shipping. 9. BUILDING:•	-Self-framing gable roof metal building, 14'-0" x 50'-0" x 12'-0" low eave (approximately).•	-Exterior 22 gauge (0.0336") pre-painted steel (colour TBA)•	-Interior 24 gauge fluted aluminium sheet liner, colour: white•	-R12 wall & R20 roof insulation, both with 4 mil vapour barrier•	-Two (2) 40" x 40" double glazed sliding windows c/w screen•	-One (1) single door c/w panic hardware, canopy, IWG 24" and 24" check chain, weather-strip,•	sweep, threshold, lockset•	-One (1) double door c/w panic hardware, canopy, IWG 24" and 24" check chain, weather-strip,•	sweep, threshold, lockset•	-Four (4) 30" x 18" adjustable louvers c/w screen•	-Continuous ridge vent•	-Four (4) building exhaust fans (two (2) high, two (2) low)•	-Ice rake, 100'-0"
10. STRUCTURAL STEEL SKID:•	-One (1) 14'-0" x 50'-0" structural steel skid•	-3" x 3" x 3/16" angle floor support•	-1/4" flat plate floor (seal welded interior, stitch welded perimeter)•	-Two (2) floor drain sumps per skid, with 2" piped to nearest skid edge (Natco standard)•	-3" high skid perimeter drip lip (seal welded on inside only)•	-Six (6) point jack and roll lift•	-3 Ton trolley for servicing 6" Orbit valves.•	-3" Fire retardant insulation under building•	-Note: Structural steel is not designed for low temperature•	-Skid drains are not insulated or heat traced•	Note: The towers, regeneration gas heater, and regeneration gas cooler are stand-alone and•	mounted on foundation by others. o	Supply, install and hook-up four (4) 175W Metal Halide, pendant mount indoor lighting fixtures each c/w integral ballast, lamp, globe, guard, reflector and one (1) ON/OFF switch. o	Supply, install and hook-up two (2) 70W HPS, wall mount outdoor lighting fixtures c/w integral ballast, lamp, globe and guard. o	Supply, install and hook-up two (2) ESD Pushbutton, 24VDC, c/w shroud and legend plate. o	Supply, install and hook-up one (1) exterior H2S alarm strobe, 24VDC, c/w blue lens. o	Supply, install and hook-up one (1) UV flame detector, 4-20mA O/P, c/w swivel mount. o	Supply, install and hook-up two (2) smart LEL combustible gas detector, 4-20mA O/P, c/w sensor separation kit and test gas applicator. o	Supply, install and hook-up two (2) smart H2S gas detector, 4-20mA O/P c/w sensor separation kit and test gas applicator. o	Hook-up only forty-four (44) 4-20mA analog instrument. o	Hook-up only fifteen (15) remote RTD on TT's.•	5. Building and vessel ground lugs are included.